Aliens always come to Earth to harvest our precious natural resources. The either want our water, our blood or our women. 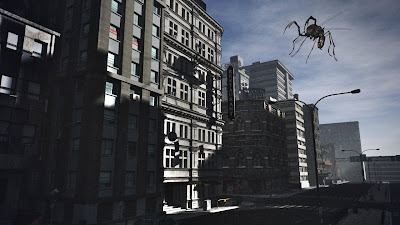 In film maker Michael Peterson's upcoming feature "Insectula" giant insects from another world come to Earth in search of CO2, stomp our cities into dust and rip bikini girls to pieces. Peterson's film is a cornucopia blood, guts, gore, giant CGI bugs, bikini's and bad mustaches. 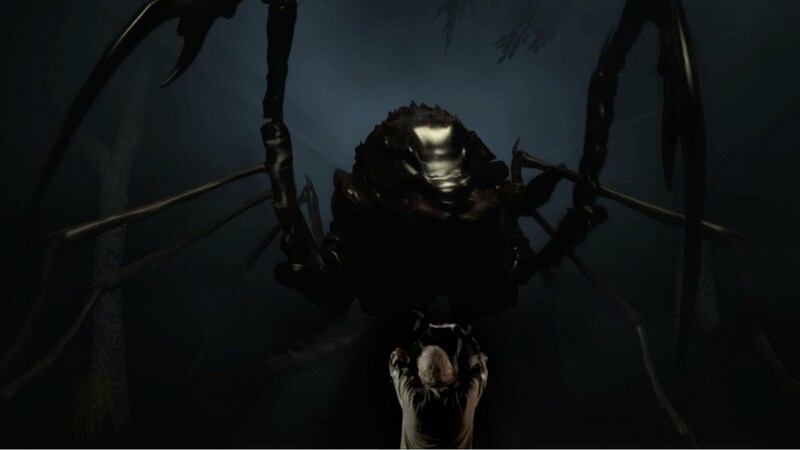 Granted what we see in the film's trailer is far from the finished product but so far "Insectula" looks like some really great late night movie cheese. A giant alien mosquito-type insect is drawn to earth from the CO2 pollution in search of blood. Del, a government agent, loses loved ones to the creature and is on a personal vendetta while the Dr Kempler is captivated by it and attempts to help the creature cleanse the earth. 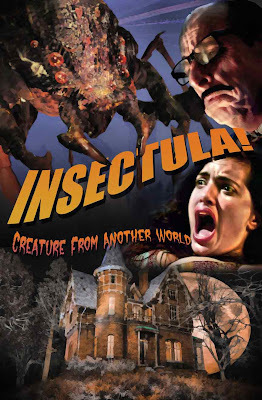 Avery Guerra: Is the full title Insectula! Creature From Another World or just Insectula!? Michael Peterson: The original working title was Insectula! Creature From Another World, but now it has been shortened to just Insectula! AG: So what’s the film about? 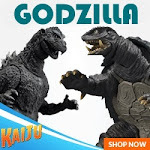 The title seems to suggest a single entity on a rampage, but from the trailer it appears that there are various types of giant creatures in it. MP: The movie is really kind of a throwback to the nuclear monster movies of the ’50s and ’60s, but using global warming instead. A giant mosquito-like alien travels from planet to planet searching for increased CO2 levels indicating life, much like a real mosquito is attracted to CO2. Its embryonic stage is in a lake so it’s of a different form than its adult stage. 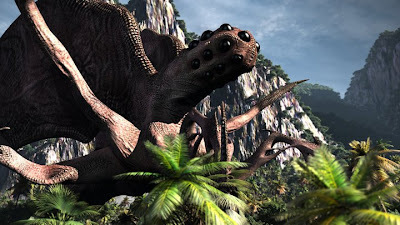 The other giant monsters in the trailer are creatures on its planet, and some of that is because I was using the trailer for funding purposes. I would imagine we will have a much different trailer when we get closer to release. Sub plots involve a government agent with a vendetta against it and a mad scientist-type character who wants to help it “cleanse” the earth. AG: Sounds great! What inspired you to make this sort of film? And what filmmakers have influenced your approach to filmmaking? MP: I spent my childhood down in the basement watching Super 8 creature feature movies over and over and reading Famous Monsters of Filmland. This film is an ode to those movies. People now can buy or watch whatever movie they want, but back then you had the Super 8s borrowed from the library and creature features on Saturdays and that was it. It was much more exciting when a movie you liked was coming on. That’s why I have a real soft spot for the older Corman films, but Hitchcock, Carpenter, Sam Raimi all had an influence, I think. I’m probably closer to the sensibilities of Raimi than the rest as it seems like we may share the same sense of humor. AG: How did this particular film come about? MP: I was working on some test scenes as a proposal to do effects for another movie. I did them very easily and quickly and they looked really big budget. I thought Man, I could make a pretty big-looking picture for a really low cost. Eventually I decided that’s just what I’d do. There is a real lack of giant monster films [lately] and I really like them. There was Cloverfield and 1998 Godzilla etc., but I really wanted to revive the melodrama that sometimes occurred in the older ones. 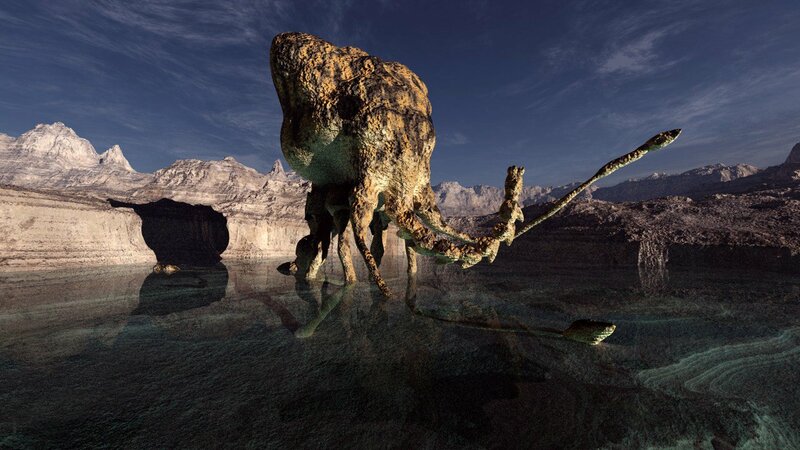 Plus making a giant monster film on my budget seemed almost impossible, so some of it was really a test to see if with the tools we have access to at home I could accomplish very difficult challenges. 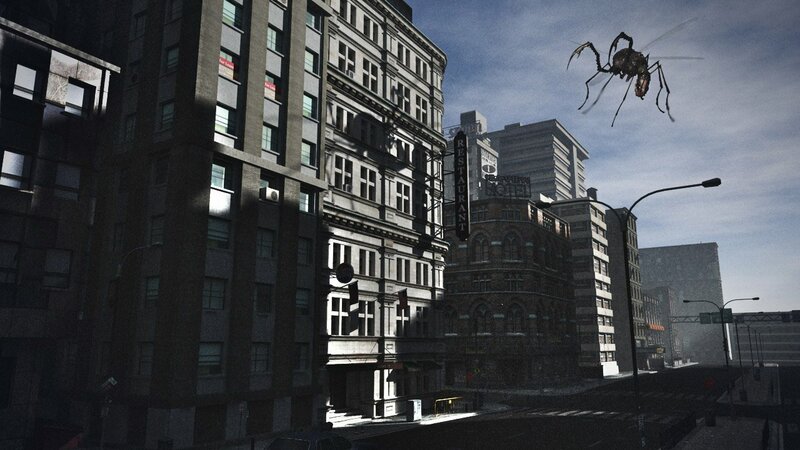 AG: What types of FX are being used to bring Insectula! to life? Old style or new? 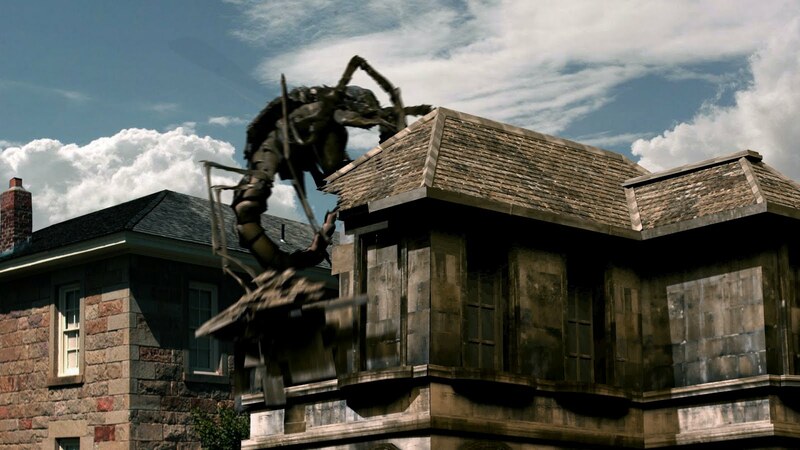 MP: I’m very partial to practical effects actually … cable controlled, stop-motion, puppets and miniatures. But they just weren’t doable with my budget. I’m trying to mix as much practical as I can afford and having to mix that with CGI. I’m doing a lot of the CGI myself so I’m remaining very cognizant of not getting too cheesy-looking. AG: What are some films that you’re using for inspiration to make this film? 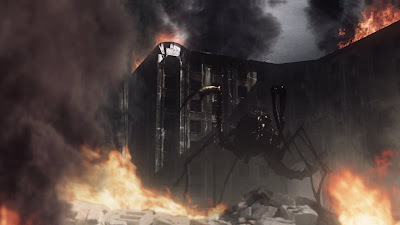 MP: Them!, The Deadly Mantis, It Came from Outer Space and the Japanese Toho pictures are the basic ones. However, I’m throwing in a lot of stuff, such as odes to Kubrick, Hitchcock, Twilight Zone, Jaws — really everything I love. I’m mashing it all together and keeping it from being too serious — without venturing into the Scary Movie overt comedy style. AG: What are some of your favorite creature features? MP: The ones I mentioned earlier are probably my favs. I think The Deadly Mantis and Them! because they did such a wonderful job on the monsters. Tarantula was another good one. My original premise was to do something along the lines of The Giant Claw and have a real goofy monster, but I rethought that, fearing the goofiness would wear thin. Plus I’m not making fun of these films … I love them, and to mock them wouldn’t be fair. So I put my head down. AG: What can fans of the genre expect to see in this film? MP: I’m trying to bring the vibe from the above-mentioned films into this one. It’s campy but not mockingly. I’m using the algorithm Scorsese’s The Aviator used to emulate the old Three-Strip Technicolor process. I saw that used on Hobo with a Shotgun recently and they actually used Technicolor people on it, but I must say I don’t think they did it quite right. They went overboard. The people using Technicolor back then tried very hard to tone it down and make it look natural; it’s just that colors would pop out in spite of their best efforts. AG: What was your estimated budget? MP: I shot about 50% of the movie myself and we haven’t finalized our budget deals so far so I can’t tell you right now. Suffice to say that this will be completed for a shockingly low price for the quality. I’m trying to show what can be accomplished. We shouldn’t even get close to the budget of Gareth Edward’s Monsters, which in itself was low. AG: What sort of release do you hope to obtain? MP: I’m talking with a foreign distribution company so we should have good reach into Europe and Asia. We haven’t ventured into the domestic distribution yet. 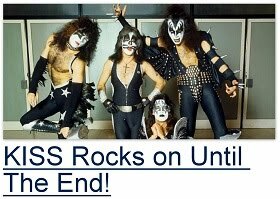 I expect to release it sometime in 2012 is all I can say right now.